Reg started his practice in Erickson in 1976 when he moved from Winnipeg to his hometown. After being in vari­ ous locations, he purchased and renovated the old Post Office building on First Street south. 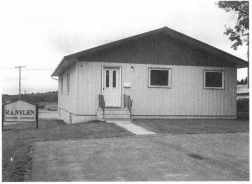 In 1997 a new build­ ing was constructed and the old building was moved to Minty's Moving near Onanole where it became their office building. Reg presently employs a staff of six including his wife Sharon, Bev Turubull, Kerrie Butler, Ken Sharpe, CA., Lynn Bialas and Tamara Lee (part-time). W. R. Piett bought the insurance business from Harold Paulsen in February 1979. 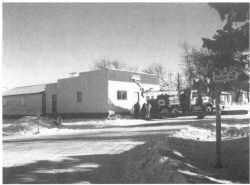 The office was in the current town office building. Mr. Piett bought the old Royal Bank building from Parkwood Auto in 1981 and moved the insurance business into that location, also securing a Sears Catalogue outlet. Ken Greavett purchased W. R. Piett Insurance and changed the name to Parkway Insurance in 1985. The business sells home, farm, auto, business and medical insurance along with investments and drivers' licenses. June 12, 1968 the General Motors Dealership, owned by Gordon Freko, known as Gordon's Service, was purchased by Dennis Coey and John Gustafson. The name changed to Parkwood Auto and, in 1974, Parkwood Auto became a Ltd. Company. Shareholders were Dennis Coey, President, and John Gustafson, Sec. Treas., onna Coey and Leona Gustafson, as Directors. Parkwood was one of the province's first full line G.M. Dealerships. Customers came from near and far to purchase their vehicles. The dealership has won many awards from G.M. through the years. Don Steele, Parts Manager, has been with Parkwood since inception. Chad Wruth, being Parts Counter person from 1995. Tom Wruth was employed as Teclmician shortly after 1968 and is now Service Manager, with many awards and accomplishments. Blair Kawalchuk, as Technician, Richard Kramer, Tires and Oil, Dianne Davey, Accountant, Gail Davis, Sales Manager, and Bert Austin, Salesman, since shortly after 1968. Parkwood has the latest in computers with direct connection with General Motors through satellite. Parkwood Auto Ltd., on June 12, 2000, will celebrate 32 years of serving Erickson and area in the latest technol­ ogy from sales, service and parts.